Really, What is Valentine's Day? Lupercalia was known in Roman mythology as an ancient Roman fertility rite called the Feast of Lupercus, which was celebrated on February 15and named after the Roman god Lupercus who was to protect flocks from being attacked by wolves at night. Another part of this Lupercalia celebration was to honor Juno, the Roman goddess of women and marriage (somewhat connected with what St. Valentine did which caused imprisonment for him), and Faunus (associated with Pan), the god of nature. In this part of the annual celebration women would put their names in a box and teenage males would draw a name and the two of them would be pair up for one year until next year’s celebration of Lupercalia. All these are nice stories! Even so, they are examples of the ongoing efforts of religious leaders of the Christian church to appease their members and new converts through syncretism. By definition, syncretism is “a combination, reconciliation or coalescence of varying, often mutually opposed beliefs, principles of practices into the new conglomerate whole typically marked by internal inconsistencies.” Most people today could remember the story of St. Valentine, but not so with the different celebration noted here. Mostly, mythological stories are soon forgotten. In Greek, he is called Eros, the god of love, and son of Aphrodite, the goddess of love and beauty. 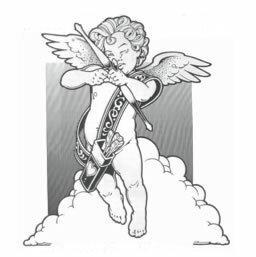 Cupid has always played a role in the celebrations of love and lovers, including those of a mischievous, naked, winged child carrying a bow and a quiver of arrows. Because of this visionary picture he is sometimes regarded as taking aim with his gold-tipped shafts at the heart of mankind. For such are false apostles, deceitful workers, transforming themselves into the apostles of Messiah. And no marvel; for Satan himself is transformed into an angel of light. Therefore it is no great thing if his ministers also be transformed as the ministers of righteousness; whose end shall be according to their works, 2 Cor. 11:13-15.